The ProForm Performance 600C treadmill offers the combination of low price and high-end features like runner’s track, motorized incline, iFit compatibility, and many more. An upgraded version of its sister model – the Performance 400C – the 600C is one of the best machines in its class. The ProForm 600C features a 60″ track, which offers enough space for you to train comfortably. This is a much-needed improvement, as its sister version – the 400C – only has a 55″ track. The extra five inches of length gives more room for taller people to stretch out their stride. The 600C offers 22 built-in workout programs for you to choose from (4 more than the 400C). All you have to do is choose the program you want and press the ‘start’ button to get started with your workout. This feature remains the favorite of many users mainly because of the amazing benefits an iFit account offers – customized workout programs, access to a huge library of workout videos, audio instructions from professional trainers, the ability to track your fitness progress, and so many more. Above all, an iFit account allows you to choose any route from anywhere in the world using Google Maps. Once you do, the machine will adjust its incline to match the terrain of your choice. You can also watch the visuals of the route on your laptop or tablet as you run. This is a great feature that makes an otherwise boring workout session very exciting. The entire deck is cushioned to offer you a comfortable training surface. You will not find a better cushioned, more forgiving surface in this price range. It reduces the strain on your joints greatly and helps you recover quickly even after intense training sessions. The ProForm Performance 600C treadmill has heart rate sensors built into the handlebars. It has a six-inch backlit LCD display, a workout fan, and an iPod-compatible music port. The 2.75 CHP motor is ideal for walking and jogging. Serious runners should look for a treadmill with a 3.0 CHP motor and above, like a model from the Sport or Pro series. It is disappointing because the treadmill has so many other features that are designed specifically for runners – the longer running track, higher speed, and higher incline. With a more powerful motor, the 600C could have been a great choice for runners. The treadmill is iFit compatible, but the module is not included in the package. You also have to pay a monthly subscription fee for an iFit account. If you are on a small budget, you should take these additional costs into consideration before buying the treadmill. Still, iFit is well worth it for the wealth of features that it offers. Your first year is typically free when you buy the module. 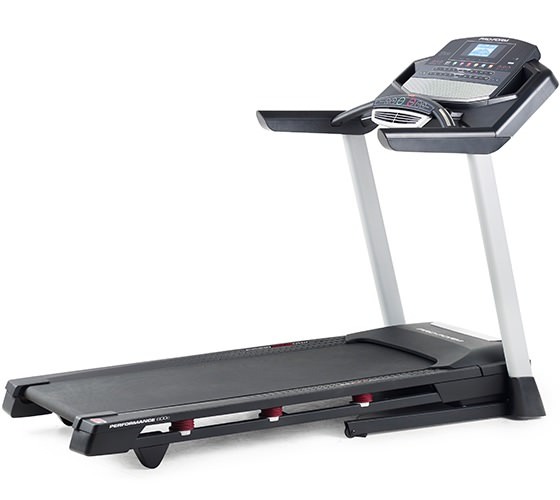 The ProForm Performance 600C, with its wide range of features and affordable price tag, bridges the gap between a budget treadmill and a high-end treadmill. The only notable disadvantage is the motor, which is not suitable for heavy running. Otherwise, this is a very good treadmill that offers great value for your money. If you really enjoy running, you might want to look at other options like ProForm Sport 9.0 S and NordicTrack C 990. For a couple hundred dollars more, you can get a machine with a stronger motor, steeper incline, and more built-in workout apps. If you would like to purchase the new ProForm Performance 600C definitely do so at the manufacturer’s official site where they have the best deals throughout the year.